I went skiing yesterday... yes 60 degrees not a cloud in the sky skiing. Ahhhh it was wonderful... and very tiring haha so when I got home I HAD to bake something to re-energize me! 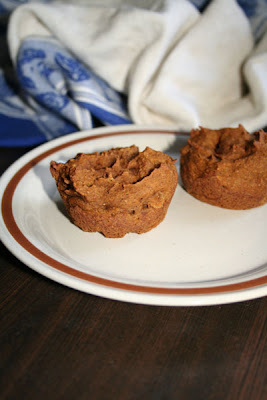 Pumpkin Bran Muffins came to mind....I love these muffins. They are perfect for a snack or an addition to breakfast. Super healthy and super super delicious. I mean who doesn't love pumpkin? Ok probably a lot of people but seriously I'm in love with pumpkin anything :) A half dozen of these were polished off by a certain someone within minutes of them being done. Hope you like them! Preheat oven to 350 degrees (325 convection). 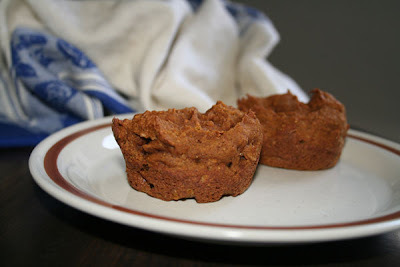 Spray muffin tins with non-stick oil. Sift together flour, salt, baking powder, baking soda, and spices. Stir in bran flakes. In separate bowl, beat together brown sugar, pumpkin puree, and the egg. Slowly add dry ingredients to pumpkin mixture. Beat well, until smooth. Fill muffin tins two-thirds full. Bake 20-25 minutes, or until toothpick inserted in center of muffins comes out clean.